British Royal Weddings have become known over the past centuries for their grand traditions and pageantry. I remember waking up very early in the morning to watch the wedding of Prince Charles and Diana Spencer in 1981 and most recently the wedding of Prince William and Kate Middleton in 2011. 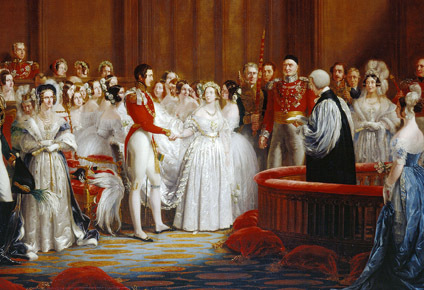 (For more information about these two weddings, please click on the link to the British Royal Weddings Part Four) In this post, I will start a four part series, by discussing the clothes, customs and traditions of British Royal Weddings starting with the wedding of Queen Victoria. 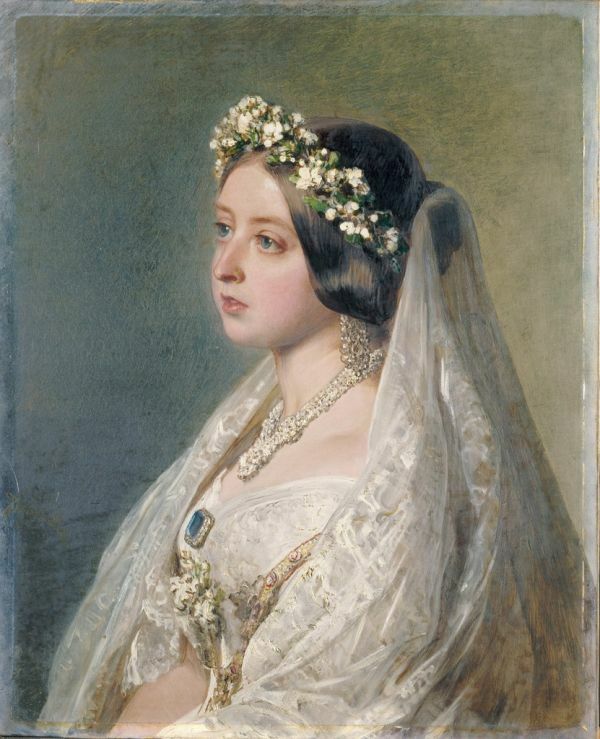 Queen Victoria had ascended to the throne in June 1837 and quickly she had been encourage by her favorite Uncle Leopold to marry her second cousin, Prince Albert. On Albert’s second visit to England after the coronation, Victoria soon became smitten with the handsome Albert and because of her royal status as Queen protocol dictated that she was required to propose to him, which she did in June 1839. Shortly thereafter, Victoria called a meeting with her Privy Council and wedding plans were finalized for the beginning of the following year. The wedding ceremony started as Albert entered the Chapel and proceeded to the altar while Handel’s “See the Conquering Hero Comes” appropriately played. Victoria walked down the aisle on the arm of her uncle, the Duke of Sussex, who officially gave her away. It was noted that as the vows were exchanged, Victoria’s eyes filled with tears possibly expressing her deep happiness at marrying her handsome prince and finding her one true and lasting love. After the ceremony, there was a reception held at Buckingham Palace. A celebration banquet and the newly married couple cut a massive wedding cake. The cake was nine feet in circumference, weighed three hundred pounds and was decorated with a Britannia figure depicted with cupids at her feet. Later, at four o’clock in the afternoon, Victoria and Albert left London for nearby Windsor Castle for a four day honeymoon. The wedding of Queen Victoria and Prince Albert set quite a few precedents and created many royal customs and traditions which are still observed today. One of the first precedents set was that prior to the wedding of Queen Victoria, most royal weddings were usually celebrated at night, but the Queen decided to break with this custom and her wedding ceremony was held at one o’clock in the afternoon. Since then, most royal weddings have followed this new Victorian tradition and are generally held in the early to late afternoons. Another royal tradition was set by Queen Victoria and it has been said that she started a bridal custom of wearing a white wedding gown. Prior to that time royal brides wore elaborate dresses made especially for the occasion from gold or silver fabric sometimes embroidered with silken threads and embellished with semi-precious stones to show their wealthy status. Ordinary brides of the working class wore their “best dress” usually made in a dark and durable material. 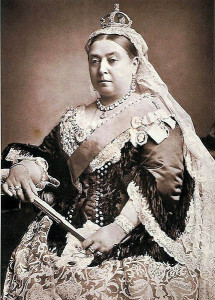 Queen Victoria wore a white satin dress which featured a separate bodice top and a full skirt which featured a court train that measured 18 feet in length and had a border of orange blossom sprays that matched the head wreath that Queen Victoria wore on her head to secure a square Honiton lace veil. Orange blossoms were a bridal tradition which were often worn to symbolize chastity and fertility. Speaking of flowers, Queen Victoria carried a small bouquet of snowdrops which were Prince Albert’s favorite flower. Legend has it that the myrtle supposedly used in her bridal bouquet has been used by every royal bride since the time of her wedding including most recently by Catherine Middleton when she married Prince William in 2011. The tradition of the myrtle first started when the Princess Royal Victoria, the eldest child of Queen Victoria and Prince Albert, married Prince Frederick of Prussia in 1958 and continued thereafter for their other four daughters’ weddings. In fact the myrtle planted during Queen Victoria’s time, that still grows in the garden at Osborne House, did not come from her bridal bouquet but it originally came from a nosegay presented by Prince Albert’s grandmother during a visit to Prince Albert’s homeland of Germany several years later. To conclude this post, I have a few last additional notes regarding Queen Victoria’s bridal veil. Queen Victoria continued to wear her bridal veil long after her wedding day. She wore it for the christenings of her nine children and the weddings of several of her children. Queen Victoria wore her bridal veil for the final time in 1897 for her official photograph on the occasion of her Diamond Jubilee. When she died a few years later in 1901 her request was to be buried alongside her beloved husband, Prince Albert, who was laid to rest almost 40 years earlier in 1861 at Frogmore in the Windsor Great Park. As a fitting final tribute to him, the Queen also requested the she be buried wearing her wedding veil. For more information about additional British Royal Weddings, please click of the following links: Part Two – Prince Albert (later King Edward VII) to Princess Alexandra of Denmark and Prince George (later King George V) to Princess Mary of Teck. Part Three – Prince Albert (later King George VI) to Lady Elizabeth Bowes-Lyon and Princess Elizabeth (later Queen Elizabeth II) to Prince Phillip. Part Four – Prince Charles to Lady Diana Spencer and Prince William to Catherine Middleton. All images and text from this site are the sole property of The Enchanted Manor and may not be used or copied without consent. If you wish to link to this site or post from this site please give appropriate credit.